Windows 7 is designed with library folders, which allow a thematic grouping of contents, which makes browsing much simpler. 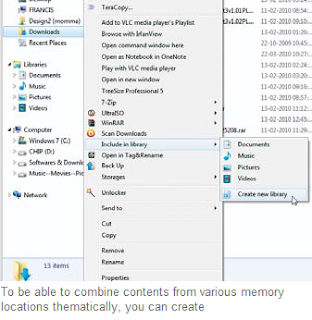 While the default library folders like ‘Pictures’, ‘Documents’, ‘Music’ and ‘Videos’ might not be suffi cient, you can further add folders to the libraries. To access the library folders go to Windows Explorer and you’ll notice the available folders under ‘Library’ on the left-hand side pane. Click on the arrow in front of a library folder to list the subfolders. Windows displays these directories in levels and sub-levels. If you want an additional library folder, right click on ‘Libraries’ and select the option ‘New | Library’. Give it a name when prompted and subsequently click on the ‘Add folder’ option on the righthand side pane. In the following dialog box navigate to the first folder, which you wish to allocate to the library and click on ‘Include folder’. Now, to add a subfolder to the library folder, right-click on the folder, select ‘Properties’ from the context menu and in the following dialog box, click on ‘Add folder’. Here, you can even remove a folder from the library, just mark the folder under ‘Location for libraries’ at the top edge of the dialog box and click on ‘Delete’. With the ‘Show in the navigation area’ option, you can specify whether Windows should display the library folders under ‘Libraries’ in the navigation area. Uncheck this option so that these library folders can be seen only on the right-hand side of Windows Explorer, as long as you mark the ‘Libraries’ option in the navigation area. Confirm the changes with ‘OK’. You can even change the display of the contents in a library folder. By default, Windows shows the contents in the ‘Folder’ view. This means that the right-hand side area of Explorer displays the folders and files that are inside every folder in the library. On the right-hand edge of this area, near the ‘Allocate by’ option, click ‘current view’ to select between the various views available. On of the interesting views is the ‘Name’ view, which hides the folder structure within the library and displays only the fi les in it, which could be located directly in the allocated folder or in a folder within this directory.